The MCB11xx, MCB11U10, MCB11Cxx and MCB13xx boards provide MCU pin access to the I/O ports. For the MCB11xx, MCB11Cxx and MCB13xx board, pins for PIO0.0 - PIO0.11, PIO1.0 - PIO1.11, PIO2.0 - PIO2.11 and PIO3.0 - PIO3.5 are accessible on the board. 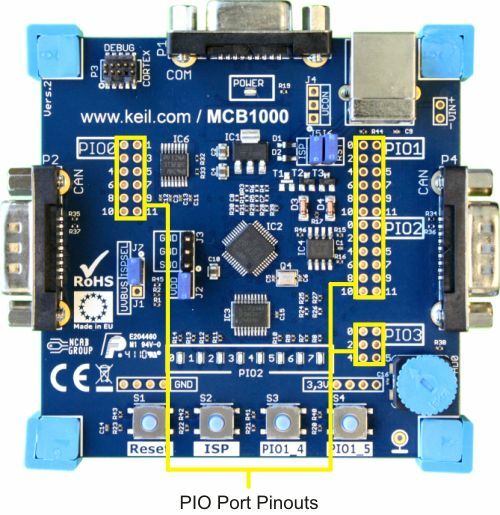 For the MCB11U10 board, pins for PIO0.0 - PIO0.23, PIO1.13 - PIO1.29 are accessible on the board.